Sizes here are basic guesses from discussions across several games and forums, subject to interpretation. — Rest injury, immobilize (ie. wrap, etc), soak to reduce inflammation. — If needed, analgesics can be taken for pain and inflammation, though it is usually best to avoid using drugs with dragons. — Injuries that either tear the cartilage of the leading edge of the wing or the wingsail itself require more extensive treatment beyond rest and immobilization. Wings can be mended by sewing long strips of reeds to the wing itself to act as replacement wingsail until the sail itself is healed. Be sure to seek out a Dragonhealer or Weyrhealer. 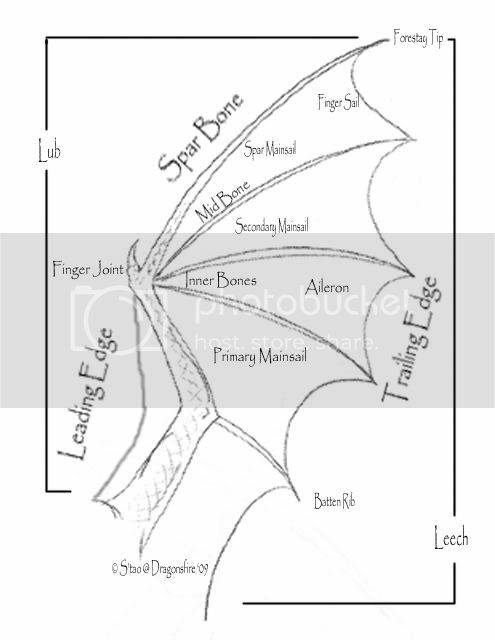 — Dragons with an injury involving the hindleg and/or wing cannot fly. — Clean the open wound with redwort and allow to heal in the open air. — Deeper cuts may need to sutured. Contact the Weyr's Dragonhealer or Healer. — Numbweed acts as a clotting agent as well as keeping area moist to encourage good healing. LUB — The whole upper edge of the wing, from shoulder to forestay tip. LEADING EDGE — The top cartilage of the wing. LEECH — The whole lower edge of the wing, from the body to the forestay tip. TRAILING EDGE — The lower cartilage of the wing. BATTEN RIB — Cartilage ribs within the mainsails, joining sections of aileron to other ribs as well as the different bones/body. AILERON — The sections and membranes which make up the mainsails. BONES — The wing has 4 major bone groups, each made up of 3 sections. Inner Bone, Mid-bone, Spar Bone, Outer Bone. MAINSAIL — The wing has 3 mainsails, each made up of aileron and batten ribs, Primary Mainsail, Secondary Mainsail, Spar Mainsail. FINGER SAIL — The section of the spar mainsail which reaches diagonally from the lowest minor joint of the spar bone to the trailing edge. FINGER JOINT — An extra bone which protrudes from the "hand" of the dragon from the same point the other bone sections merge.